Note: I was going to write about my ‘firsts’ here in KSA today, but I’m stuck on coffee instead, sorry Meredith, I promise I’ll get to it soon! I am from Seattle. We love coffee there. We generally think Starbucks is crap and will spend hours discussing the region, roast, soil quality, and brew method of our beans with our favorite baristas (or baristos). When I lived in China, I was aghast that the coffee all seemed to be Nescafe instant, which is like trying to sell someone vinegar as wine, sure its made from grapes. The only bean brewed coffee in China was Starbucks, which broke my little rain-drenched Seattle heart. Saudi, I read, is the most coffee drinking country in the world. Great! They make this amazing strong coffee, like Turkish coffee but with spices like cardamom and ginger. Oooooo! So excited was I to have great coffee available to me in my new home. Oh, no. 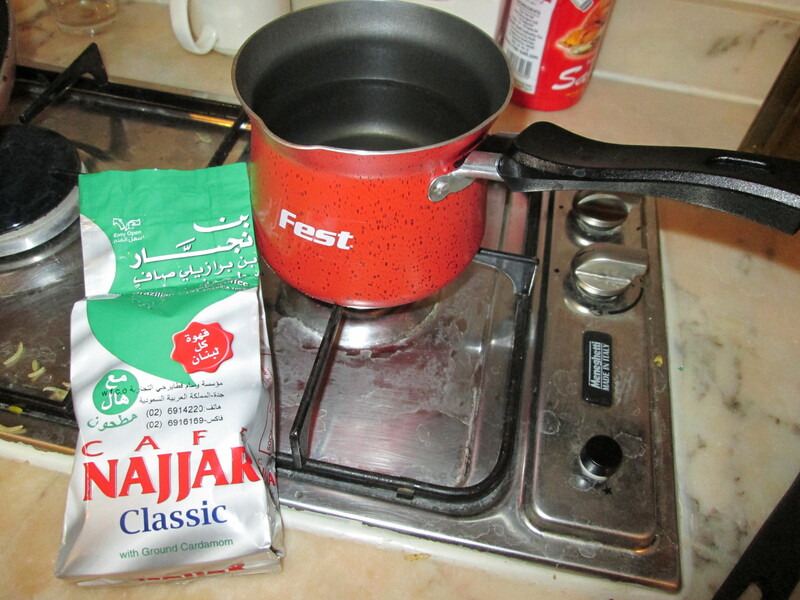 Not only is 90% of what they sell in the grocery store some version of Folgers Crystals or Nescafe, but the stuff advertised as “Arabic Coffee” is a 2 part powder packet, half of which you boil for 10 minutes and the other half you add to the boiled mixture after you take it off the heat. 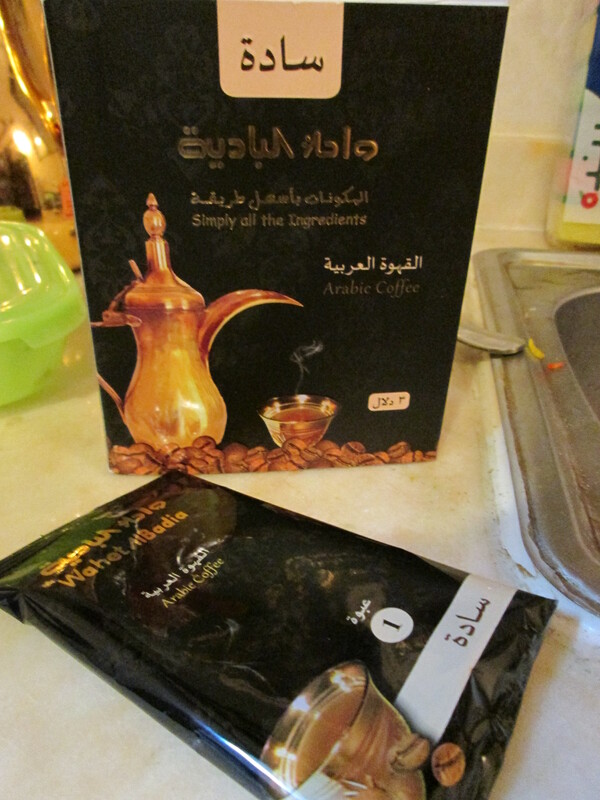 I admit, it tasted a lot better than Nescafe, but not really anything at all like coffee. It mostly tasted like cardamom and ginger, which I really like, so I may drink it again, but not when I’m looking for a cup of coffee. Then there is the school cafeteria. They serve this stuff called “Violet Coffee” which as far as I can tell is like the powdered coffee premixed with milk and sugar and crazy flavors. The menu is in Arabic, and a strange font that I couldn’t make heads or tales of at first. The girls behind the counter speak some English, but don’t really know anything about coffee. The next day, determined to get coffee rather than dessert, I try again. I ask for coffee. They say ‘what kind?’. Ummmm… hot? She lists off names: French coffee, Italian coffee, mocha, something that sounded like teruki (later I leared was meant to be Turkish), and maybe another thing I didn’t understand. Flummoxed, I asked for French coffee, thinking maybe this was an Au Lait or something, and Italian was cappuccino. Nope. Super milky, super sugary and some flavor that might have been vanilla. I can say this time there was a slight hint of coffee flavor. Back to the home front. Next trip to the grocery store, I’m searching the coffee section for anything that is a bean or ground bean product instead of a processed powdered mess. There are some whole beans, and some grinders, but no french press, which is what I’m used to. Not even a drip machine, just these little pots with a little divot of a pour spout 90 degrees from the handle. Next to the pots are sieves. It is clear to me now that I must cook my coffee in a little pot and strain the grounds out in a little sieve. So, I found some extremely finely ground, but still ground and not dehydrated-freeze-dried-pretend-coffee, beans that advised they were from Brazil and mixed with ground cardamom. I got a little pot and a little sieve and went home to test it out. On my one burner “stove” in my hotel room/apartment, I boiled up the water and threw in a spoonful of grounds. I let it cook for a while on low, then let it sit for a while to let the grounds settle. The sieve is nearly useless because the grind is so fine, but the hotel came with this pretty little samovar thermos, which keeps the coffee hot while getting the grounds to settle, and makes it easy to decant your coffee too. I had achieved coffee! This morning, I made myself a cup of joe, put it in my to go mug and ….. left it on the counter when I went to school. Slightly desperate, I went to the cafeteria before my first class and as I was staring disconsolately at the row of powders the girls used to make the coffee, my eyes alit on a coffee grinder with whole beans in the top. When the girl got to my order, I pointed excitedly at the machine with its whole beans. Coffee! I exclaimed. She pointed to the machine on the counter with a questioning look. Yes! “Espresso or cappuccino?” she asked. “No!” I crossed and waved my hands and shook my head, not wanting to receive another cup full of coffee flavored steamed sugar milk. I listened to the familiar sound of the espresso grinder– that little whir and click click noise, the steamy hiss of the machine as hot water streamed through the tightly packed grounds under pressure to pour into the waiting cup below. Finally I was presented with a tiny paper cup of espresso with beautiful crema floating above dark brown bliss, a few ounces of reassurance that everything will be ok.